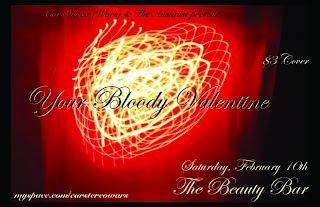 Austinist is sponsoring Your Bloody Valentine with Car Stereo Wars @ Beauty Bar this Saturday, Feb 10th. Ooo it got cold today... good timing since I'm on vacation for the rest of the week. So I'm cozying up to some Miles Davis and The Satanic Verses. This Saturday night, Car Stereo (Wars) is hosting a special Valentine's-themed party with yours truly at the Beauty Bar, with sets featuring shoegaze and r&b mash-ups, portraits by Courtney Chavanell, and other special surprises.